NextHave You Found Your “Fitness WHY”? This is a fabulous and very easy recipe to keep you full and warm during the winter months. It is also a great way to get a daily dose of offal without even realising, because the slow cooking changes the taste and texture. 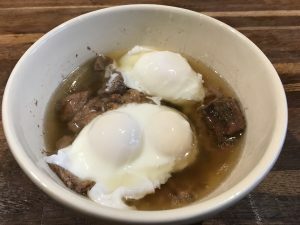 This Mighty Meaty Broth is very nutrient rich and with added extra of a hard boiled egg or two (or poached) it will keep you satiated – and your protein requirements up until your next meal. Bones: Try and use meaty ones like beef or lamb, using up the remains of a roast dinner with some extra bones from your freezer stock thrown in! Marrow bones, sliced down the shaft from your friendly butcher are also an excellent choice. Meat: Use up left overs, and for mine I also added 500g diced stewing beef, 400g diced liver, one diced lamb heart, one diced lamb kidney, 200g diced sweetbreads (sheep thymus gland – optional!). Think plenty of varied chunky meats. 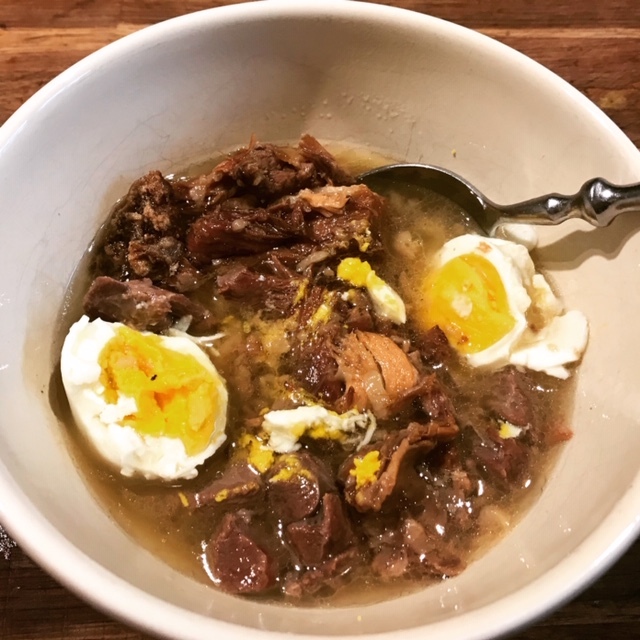 Oxtail and short ribs are also excellent in this broth. Put everything into a large pan or slow cooker and fill to the top with water and a teaspoon of sea salt. Bring to the boil and then simmer for 24-48 hours. Smell the delicious aroma emanating from your pot! Hard boil some eggs (or poach a couple when you are ready to serve). Remove the bones from the broth. Use a slotted spoon to put a large helping of meat into a warmed bowl, then ladle in some of the liquid. Add your eggs (whatever style you prefer) and enjoy! The broth can be kept on low on a slow cooker setting or placed in the fridge to cool. Be aware that the fat will set on top once cooled. The fat is good for you (particularly from bone marrow) so break it up and make sure to include some in each subsequent serving.